Six park users sat in Wandle Park Café on the 24th of September to learn how to write park inspired Haiku. The simple form of three lines, with 17 syllables of 5, 7 and 5, provided an easily learned structure. I think all the participants were delighted with the work they produced and the enjoyable time they had. I include below the work they submitted and have used initials to preserve their modesty, although Andrew Dickinson is earning the title of the new Poet Laureate of Park Haiku! I believe more sessions could be in order and maybe a Haiku Book that could be left in the Café for people to add new haiku? Haiku poetry with poets George Wright and Jane Grell. Place: meet in the Park Cafe at 12 noon. Haiku is a form of Japanese 12th century poetry. The poets will be using the park for inspiration. Free event. 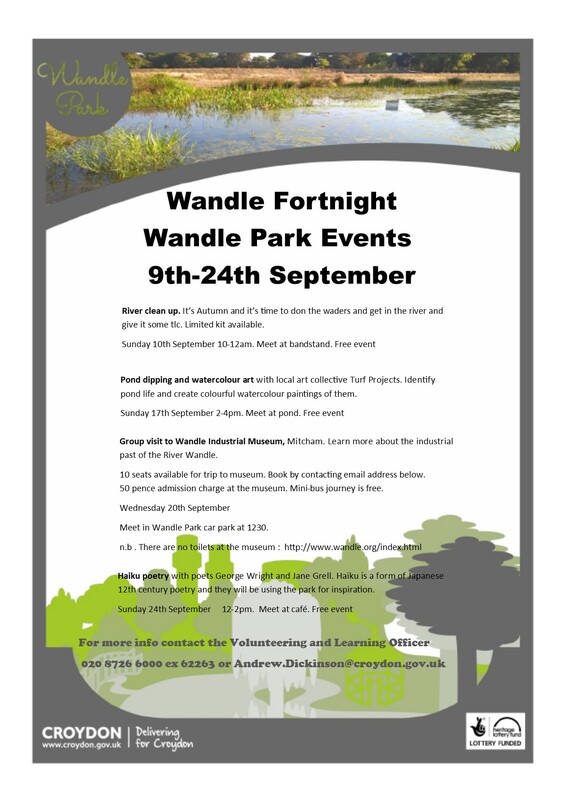 This event is part of Wandle Fortnight. Poets Anonymous, Croydon’s very own poetry group, is hosting an afternoon of poetry on the bandstand. There will be readings from members of Poets Anonymous and guests, plus there will be the opportunity for you to come and read your own poetry.